The greater Philadelphia region’s premiere mature market publication, providing news, views, entertainment and much more for its target audience -- active and vibrant readers age 50 and over. Published monthly since 1994, this newsprint magazine includes stories on health, money, lifestyle, leisure, travel, entertainment, reminiscing, and much more. The publication also offers, opinion columns, letters to the editor, puzzles and so much more -- all aimed at issues impacting active boomers and seniors. 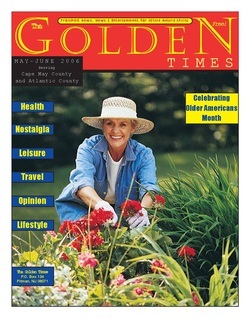 Three geographical editions of The Golden Times are published – the Southeastern Pennsylvania edition covering the five counties surrounding the city of Philadelphia; the Gloucester County (NJ) edition covering Gloucester County and parts of Salem counties; and the Camden County (NJ) edition covering Camden and parts of Burlington counties. Rates cards for each edition are accessible from the menu above. The Golden Times / Hudson Briarhill Enterprises Inc.